Chances are, if you’ve heard of Hanukkah, you’ve heard of the miraculous jug of oil that lasted eight days instead of one, the Maccabees, and of their hero, the warrior Judah the Maccabee. But there’s another hero — or in this case, heroine — associated with the Hanukkah story, and while her story is lesser known, it’s just as awe-inspiring. Judith was a young, beautiful widow who lived in the second century B.C.E, in the town of Bethulia. When Bethulia came under siege by the notoriously cruel Assyrian general Holofernes, and the townspeople were close to surrender, Judith stepped in. She begged her people to have faith and asked them to give her a chance before they gave up. They did, and that night, she and her maid set out for the enemy camp. Judith walked confidently into the camp and demanded to be taken to the general. Once in his tent, she presented herself as a Jewish sympathizer and promised Holofernes she’d help him take down Bethulia. The general, who was instantly smitten, invited her to a feast. Judith came prepared. She brought her briny, homemade goat cheese to the feast, persuaded the general to partake of the salty dairy and when he got thirsty, plied him with strong, undiluted wine. In a matter of minutes, he’d passed out, and lay sprawled across his tent in a drunken stupor. Judith, alone with him in the tent, uttered a silent prayer asking for help and strength. And then, in one swift motion, she unsheathed his sword and beheaded him. Suffice it to say, Bethulia emerged victorious. Judith brought Holofernes’ severed head back to her community elders, who then launched a surprise attack on the Assyrians. The Assyrians, who found their commander laying headless in his tent, fled. 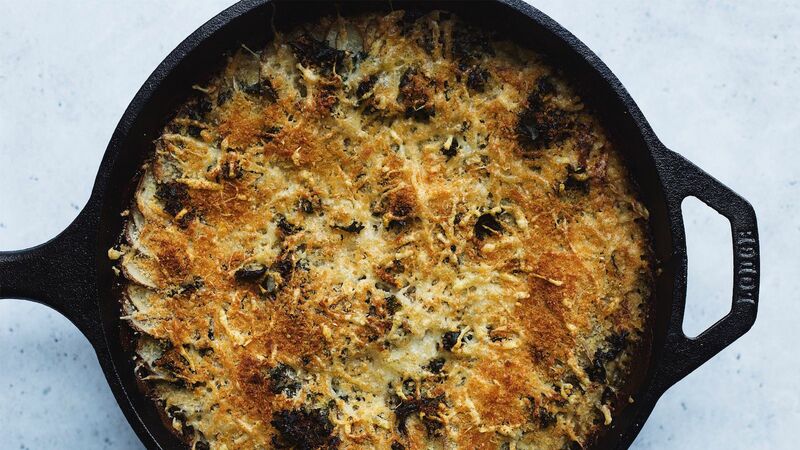 Judith had courage and bravery in spades, and today, in her honor, it’s customary to eat dairy on Hanukkah I love this gratin for Hanukkah parties because it feeds a crowd, incorporates cheese and because it features these thinly sliced potatoes, it’s like one big cheesy latke. 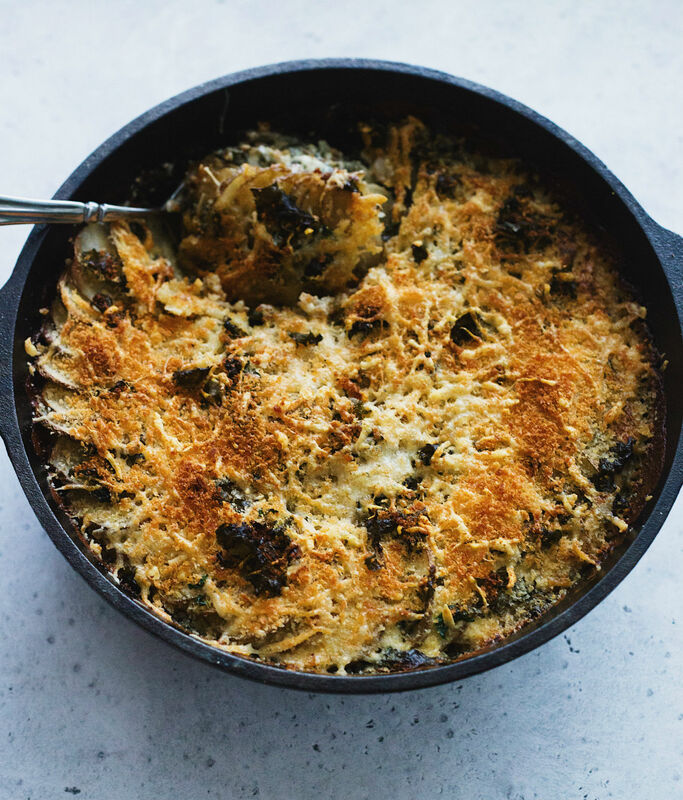 The kale is a hearty addition which breaks up all the creamy, cheesy goodness and the garlic, thyme and bay leaves add flavor. Raclette is a particular type of swiss cheese that becomes nutty and melty when it is heated up, but you could also use gruyere if you cannot find Raclette. It’s delicious, but best of all, it’s a reminder of the strength women have within, and that a single act of courage could change the course of history. Eat cheese, celebrate Hanukkah, and great Jewish women! Preheat oven to 350°. Butter the inside of a 3-quart baking dish. Bring the heavy cream, garlic, bay leaves, thyme, peppercorns and mustard and nutmeg to a simmer in a small saucepan over low heat. Let cool slightly. Remove bay leaves, thyme and peppercorns from sauce. Season the cream mixture with salt and pepper. Fan out a layer of potatoes on the bottom of the buttered casserole dish. 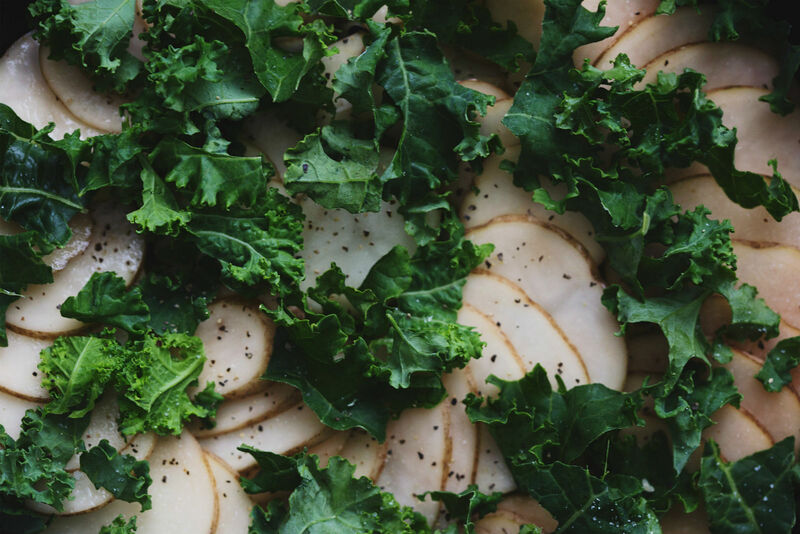 Sprinkle with salt and pepper and top with one cup of the kale. Pour ¼ of the cream mixture on top. Sprinkle with ¼ of the grated cheese mixture. Repeat with 3 more layers, reserving the last ¼ cup of cheese. Bake potatoes until tender and creamy, around 1 hour. Then cover the potatoes with foil and let bake for another 30-35 minutes, or until the cream is bubbling and the potatoes are easily pierced with a fork. Place rack in highest position; heat broiler. Mix the breadcrumbs with the remaining ¼ cup of cheese and sprinkle over the potatoes. Broil until cheese is bubbling and top of gratin is golden brown, 7-10 minutes. Serve topped with sprigs of fresh thyme leaves, if desired. Tender meatballs, chicken wings, and a heavenly sweet and sour sauce make for a delicious twist on a classic.